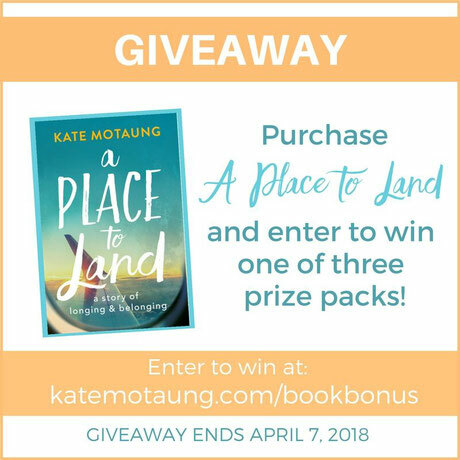 Kate Motaung is the author of A Place to Land: A Story of Longing and Belonging (2018), A Start-Up Guide for Online Christian Writers, and Letters to Grief. 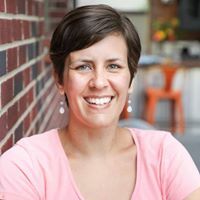 She is the host of Five Minute Friday (fiveminutefriday.com), an online community that encourages and equips Christian writers, and owner of Refine Services (refineservices.com), a company that offers writing, editing, and digital marketing services. Kate blogs at Heading Home (katemotaung.com) and can be found on Facebook, Twitter, and Instagram. Few books have challenged me the way A Place to Land has. It was a joy to be a part of the launch team and gain an in-depth understanding of the story along with special behind-the-scenes access through connection with Kate. I have laughed, cried, and worshipped while reading her story, and I closed the book (reluctantly, might I add) with a solid sense of satisfaction. I highly recommend this book to anyone who has struggled at any point to define home - whether it be physical, emotional, spiritual, or relational. The themes Kate explores are universal, crossing racial and geographic lines as well as navigating cultural and age gaps. She takes care to show honor and illuminate beauty on every stop of her journey, and I felt like a first-class passenger on each leg of the flight. This memoir has changed me and affected me deeply - not only because I could relate to much of it personally, but also because I could feel myself yearning for the healing that comes with belonging. It isn't found in one place, but in one Person, and by the end of the book I realized the redemption I had desperately sought for years was always there. I just needed to let go and accept it. I hope it will do the same for you. I received a complimentary copy of this book as a member of the launch team. Claim your copy here or wherever books are sold. There's a great giveaway for anyone who purchases the book by April 7th, so go grab a copy for yourself or a friend today! And because Kate is awesome, here's the first chapter! Q: What can readers expect from your book? Kate: A Place to Land is a memoir, so readers can expect real-life storytelling. They can expect to travel with me from my childhood in Michigan to my young adulthood in Cape Town, South Africa. I should also warn potential readers that the book does walk through some difficult topics like divorce, my mom’s cancer diagnoses, and her eventual death. It is a heavy book, by my prayer is that readers will find it therapeutic to reflect on their own difficult situations (even if it involves tears in the process), and that eventually they will land in a place of hope. Q: What do you hope readers gain from reading A Place to Land? 1) I pray that A Place to Land would increase their longing to spend eternity with God. I don’t presume to have any idea as to what heaven will be like, except for what Scripture has revealed to us. But I do think that the vast majority of us have a diluted, lukewarm view of eternity. We lack a depth of eager anticipation, and I believe that negatively affects our choices and attitudes in this life. I’ve learned through writing this book that intentionally keeping an eternal perspective at the forefront of my mind does wonders for my countenance, attitude, and actions. It has changed me in ways I never expected. 2) I pray that they would find hope in Christ in the midst of their suffering and grief. He is the only one who can relieve our pain. I pray that the readers of this book will find their anchor in Him amidst the turbulent trials of this life, holding fast to the truth that “our light and momentary troubles are achieving for us an eternal glory that far outweighs them all” (2 Corinthians 4:17). 3) I pray that they would be reminded that this world is not our home. For some, that is a comfort, knowing that one day those who trust in Christ will lay aside all their pain and suffering in exchange for a sin-free existence forever in the presence of their Redeemer. For others, this realization could be a bit disconcerting. Many of us make a great effort to find comfort, fulfillment, and satisfaction here in this life, and we don’t like the idea of giving it up. Before writing this book, I struggled with that a lot. I would get incredibly sentimental over certain material things. Now, the Lord is teaching me that those are all part of what Jesus calls “treasures on earth, where moth and rust destroy and where thieves break in and steal” (Matthew 6:19). Instead, He calls us to “lay up for yourselves treasures in heaven, where neither moth nor rust destroys and where thieves do not break in and steal. For where your treasure is, there your heart will be also” (Matthew 6:20-21). Writing A Place to Land challenged me to consider where I’m storing my treasure. Q: What was the most difficult part about writing your memoir? Kate: Writing about my mom’s death. My eyes tear up just thinking about it. I must have cried about 72 times through all the revisions and edits and more revisions. But they were therapeutic tears, and I’m so glad I’ve documented the experience, since the memory does fade. You don’t think you’ll ever forget something like that, but the details do fade. Another challenging aspect was simply trying to decide which stories to include or not include. Having amazing editors was a huge help in this process, but obviously they can only work with what I give them. There were many times when I would write scenes that my editors asked for, and I would be thinking to myself, “Who the heck cares about this? This is so boring!” But in the end, as a Christian writer I have to trust that the Lord will keep whatever words He wants to have in the book and cut whichever ones He doesn’t. Thank you Kate for sharing your heart's story.